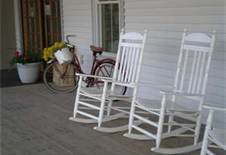 When we were in South Mississippi we lived in a home that was surrounded by acres and acres of National Forrest. During the summer months, after the children went to bed my husband and I would love to take evening swims. In the darkness of the night we would look into the heavens at the thousands of stars shining so bright. The contrast of the stars against the blanket of darkness was striking. This is how I picture the Christian’s life. We let our light shine before men in an extremely dark world. It is certainly dark times. Today’s headlines, like all others, include stories of war, scandals, terrorism, and murder. One story that depicts the nature of our world in such a clear fashion is this one. A Chinese baby boy is rescued alive after being flushed away. I am a mother. The thought of a mom giving birth to a child and then being able to take that child and flush it down the toilet as human waste or garbage is inconceivable. I can’t even comprehend the cruel heart that could do such a thing, other than the fact that we are told in Jeremiah that the heart is deceitful above all things and desperately wicked (Jer 17:9) and that one of the characteristic of the ungodly is being “without natural affection” (Rom 1:31, 2 Tim 3:3). So these gloriously dark times are grand opportunities to shine. Look at how Daniel describes the wise. “And they that be wise shall shine as the brightness of the firmament; and they that turn many to righteousness as the stars for ever and ever,” Daniel 12:3. That right! You are a star! At least those with heavenly wisdom, who point others to God, shine as stars in the darkness! But what happens to the stars when the sun comes out? John the Baptist understood this concept. He said, “He must increase, but I must decrease,” John 3:30. Our purpose as light in the darkness has never been to point others to ourselves. We don’t shine for our glory. We point others to God, for His glory. Jesus told his disciples, “Let your light so shine before men, that they may see your good works, and glorify your Father which is in heaven,” Matthew 5:16. We shine in this dark world so that others are pointed to our heavenly Father. But one glorious day, the Son whose “countenance was as the sun,” (Rev 1:16) will return and all darkness will be driven away for all eternity. 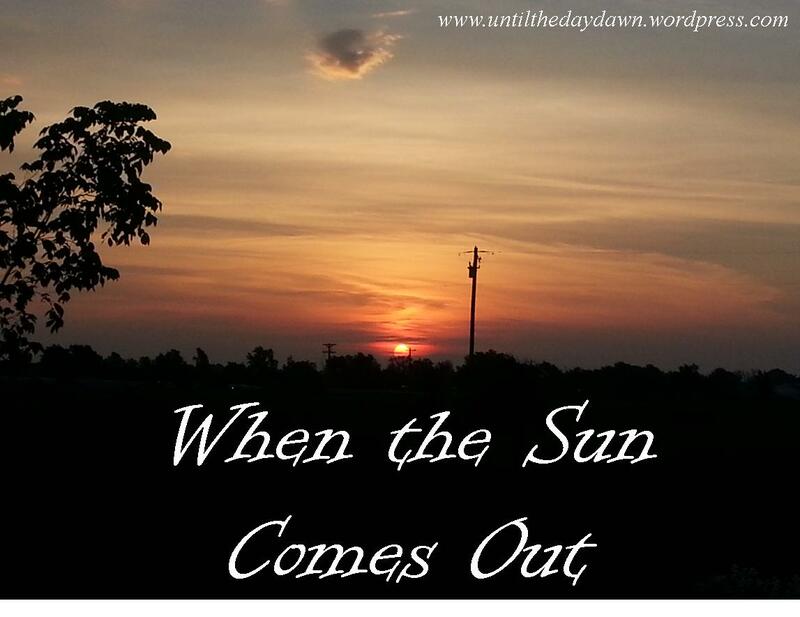 Until that day, dear Christian friend, keep shinning! Did you know that I love to ask questions? Not only do I learn from asking, but I teach thorough the use of questions as well. This is known as the Socratic Method of teaching. It is a great tool for guiding people on a journey of discovery as well as moves them toward greater understanding. 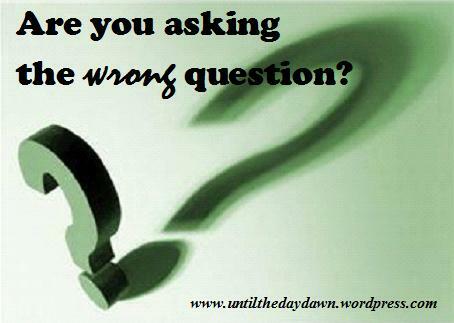 But what happens when we ask the wrong question? Logically, we would have to say that we get the wrong answer. Should a woman have the right to choose an abortion? That is the wrong question. The correct question is: Should society allow the murder of innocent babies? Should Christians be allowed to pray in government ran schools? Again, that is the wrong question. The question we should be asking is: Should we allow an ungodly government to train and educate our Christian children? When we begin to ask the right question, all of a sudden we begin to get the right answers. Is it a sin to watch this movie? Is it a sin to say this? Is it a sin to date this person? Is it a sin to (fill in the blank)? Again, we are asking the wrong question. Instead of asking if something is a sin, what every Christian should be asking is, “Is this holy?” You can ineffectively debate whether drinking is a sin, but when you ask the correct question of “Is drinking holy?” you get a clearer answer. What about asking if this movie we are about to watch is holy? Is what I’m about to say holy? Is what I am doing holy? With the correct question, all of a sudden the perspective changes. It is easy to justify certain behavior when we approach it from a, “Is this really a sin?” attitude. However, if we approach our lifestyle, our conduct, our words, and our inner motives from the thought of, “Is this holy and pleasing to God?” it becomes impossible to justify those questionable activities. I needed this reminder, because sometimes I do ask the wrong question. But as a child of God, I am called to examine my life. “Examine yourselves, whether ye be in the faith; prove your own selves,”2 Corinthians 13:5. As a child of God I should ask the Lord to search my heart. “Search me, O God, and know my heart: try me, and know my thoughts: And see if there be any wicked way in me, and lead me in the way everlasting,” Psalm 139:23-24. As a child of God I should ask if I am living in obedience. “As obedient children, not fashioning yourselves according to the former lusts in your ignorance: But as he which hath called you is holy, so be ye holy in all manner of conversation; Because it is written, Be ye holy; for I am holy,” 1 Peter 1:14-16. Lord, is my faith real? Lord, is there any wicked thing in me? Lord, am I living a holy life? These are the correct questions! If we will just ask them, the answers will drive us to our knees and point us to God Almighty. What is your response when you hear false teaching? Should a Christian expose lies taught by others? Is it our duty to call out men who preach heresies? When a false gospel is proclaimed should we overlook it? There seems to be two schools of thought on this. The first is that as Christians we are not to judge someone’s ministry. We should never call out a false teacher. If they claim to be a Christian who teaches the truth, we should take their word for it. After all, as children of God we are to unite under the love of Jesus and purposely steer clear of divisive doctrines that destroy fellowship. Didn’t Jesus want us all united? “To remain divided is sinful! Did not our Lord pray, that they may be one, even as we are one?” A chorus of ecumenical voices keep harping the unity tune. What they are saying is, “Christians of all doctrinal shades and beliefs must come together in one visible organization, regardless… Unite, unite!” Such teaching is false, reckless and dangerous. Truth alone must determine our alignments. Truth comes before unity. Do you enjoy watching TBN, listening to sermons, reading Christian books, doing Bible studies, or following after preachers and teachers? Let me offer a word of caution. Beware! 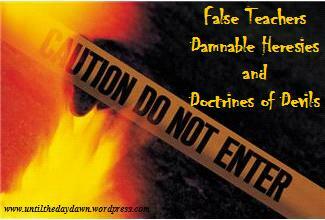 False teachers, damnable heresies, and doctrines of devils abound. Truth is not guaranteed just because someone claims to be a Christian preacher, a book is sold in a Christian book store, or a church is in your same denomination. 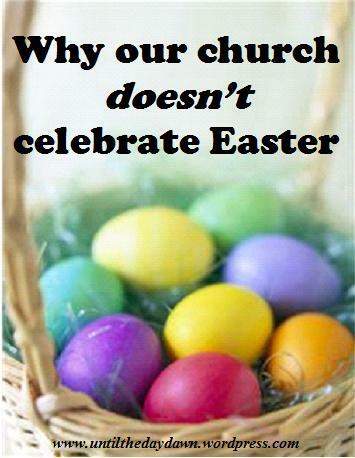 False teaching is slowly creeping into local churches all around us. It is subtle. It is hard to spot. Yet, it spreads in a deadly fashion. But, again this is really nothing new. Did you know that throughout the New Testament this is constantly dealt with? Jesus deals with false teachers and how to judge them. Paul addresses it, tells us to mark certain men, and calls those out by name who are in error. In Galatians he says, “If any man preach any other gospel unto you than that ye have received, let him be accursed.” James warns those who would be teachers of the greater condemnation. Peter deals with it, as does every epistles of John. In fact, John warns us to not let false teachers into our home (false teaches can come in via the TV, books, or computer as well), or even wish them “God speed” because in doing so we become a “partaker of his evil deeds,” 2 John 1:11. In fact, every New Testament book (with the exception of one) deals with recognizing false teachers, guarding against false doctrine, correcting false doctrine that was taught, or warning those who would be teachers. The only exception is the small personal letter Paul wrote to Philemon. Twenty-six out of twenty-seven books of the New Testament address this (listed below). Therefore, it must be important. Not only should we call out false teachers and their lies, but we are responsible to. The church is the pillar and ground of the truth (1 Timothy 3:15). We cannot even worship God without the truth (John4:24). And Jesus prayed that we would be sanctified through the truth (John 17:17). Christians need to be bold and never back down from all the truth in God’s Word. But, we also need to speak the truth in love and as much as possible,“of some have compassion, making a difference: And others save with fear, pulling them out of the fire; hating even the garment spotted by the flesh,” Jude 1:22-23. 1 Thessalonians – Chapter 4, whole chapter is written to correct false teaching that they received. Fighting the crowds and waiting in line at the drive through at Chick-fil-A last night had nothing to do with being hungry. Like many others, it was about support for this company and their biblical beliefs about the family. Today, Chick-fil-A’s all across the country are reporting yesterday’s record sales. Christian people spoke out and they used their wallets and time to do so. But they were not the only ones speaking out. At our local Chick-fil-A we saw a handful of protesters there as well. They displayed signs, talked and laughed among themselves, and smoked cigarettes. I am still not sure what these people were protesting. Was it Biblical values? Free Speech? Christian People? Or, did they just want to make a scene and show off? I don’t know. But when you look at the numbers all across the country it appears that it was the thousands of Chick-fil-A supporters that actually made the huge statements. There is no place for hating others among Christians. We are to be people of love. We are to show God’s love to the world. We should have compassion on others and strive to be peace makers. But let me make it very clear. Confronting sinners is the greatest form of love. People are dying in their sins. They are blind and ignorant to the truth of God’s perfect and holy wrath that will come if they do not repent. It is not about being a homosexual. It would be foolish to approach them from this stand point. It is about being a sinner. You see, the person who has told one lie is in just as much danger of eternal hell as the homosexual. Loving others is having enough compassion on them to be moved to action. Ignoring sinners and letting them face God on judgment day without warning is equivalent to ignoring the blind man who is about to walk in front of a speeding bus. If we truly loved the blind man we would warn him and do all we could to save him from harm. The “harm” these sinners face is eternal damnation. I have to ask myself often, How much do I really love others? And let me ask you, Christian, How much do you really love the sinner? So, let’s not look at this Chick-fil-A noise as just political, hypocritical, or pungent sounding brass. Let’s see it as an opportunity to shine light into this dark world. Those of us who have been saved have been given a ministry of reconciliation (2 Corinthians 5:18). If we truly loved the sinner, we should seek to make peace between them and God. That is what being a peace maker is about. You see, it’s not about the chicken. It’s about love. 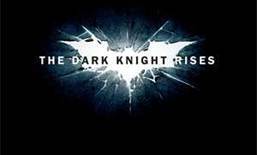 When a tragedy happens, like the recent one at a midnight showing of the latest Batman movie, people start asking questions. How can a 24 year old man walk into a theater, open fire, and brutally kill 12 innocent people and injure 58 more? What led him to do such a horrendous act? Where was God when this happened and why did He allow it? Did you catch that? Why do good things happen at all? He’s right. You see, we ask the wrong question. The question shouldn’t be why does God allow bad things to happen to good people? The truth is that as a whole there are no “good people”. “There is none that doeth good, no, not one,” Romans 3:12. We truly have a misconception that mankind is “good” and deserves God’s blessings. But Jesus clearly set the standard for goodness. “And a certain ruler asked him, saying, Good Master, what shall I do to inherit eternal life? And Jesus said unto him, Why callest thou me good? none is good, save one, that is, God,” Luke 18:18-19. Not only that, but bad things happen because we live in a sinful, wicked, depraved world. To blame God for the world’s evil condition would be equivalent to blaming a car manufacturer for a wrecked vehicle due to reckless driving. If we will be honest and look deep into the truth of God’s Word we would ask a different question all together. Why does any good thing happen to us at all? And the answer to that question is simply because of God’s great mercy. “Know therefore that the LORD thy God, he is God, the faithful God, which keepeth covenant and mercy with them that love him and keep his commandments to a thousand generations;” Deuteronomy 7:9. “For thou, Lord, art good, and ready to forgive; and plenteous in mercy unto all them that call upon thee,” Psalm 86:5. God is merciful and this is why any good thing happens. Like the Psalmist in Psalm 136, I declare “his mercy endureth for ever.” Can you say the same thing? Has God extended His mercy toward you? He is merciful to those that love Him and keep His commandments. He is merciful and good and ready to forgive those that call upon His name. The title of my husband’s sermon Sunday was “A Nation on the Edge of Heartbreak” taken from 2 Chronicles 7:12-22. 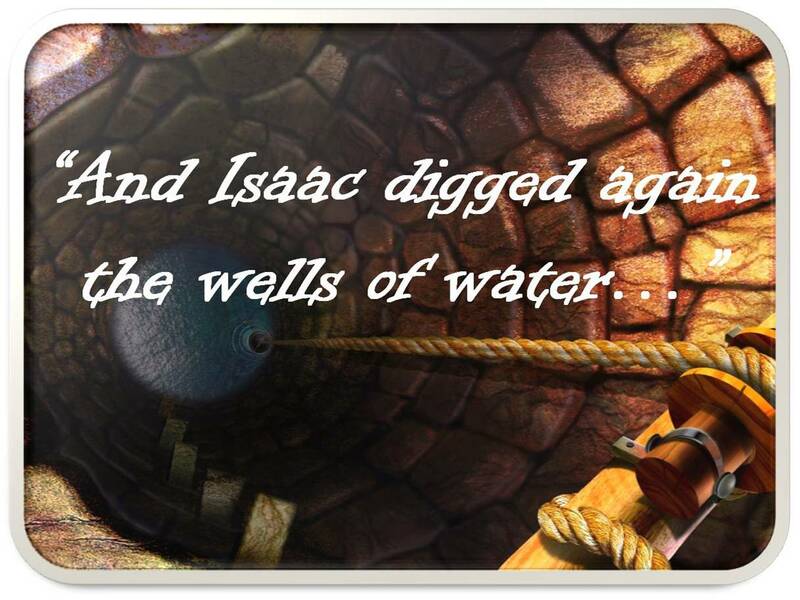 The passage deals with Solomon and the nation of Israel shortly after the completion of the Temple. The glory of the Lord fills the Temple, Solomon prays, fire comes down from heaven, the nation offers sacrifices, and celebrates the Feasts of Tabernacles for seven days. Then the Lord appears to Solomon by night with a warning. Israel was one generation away from heartbreak. I realize that America is not Israel. However, I could not help but see a striking correlation between Israel on the edge of heartbreak and our country on the edge of heartbreak. Consider the news reports, read the papers, follow the state of our country online. It is clear that we live in a very wicked and evil country, ruled by wicked and evil people. This is not to say that there are not good, godly people in our country and government. There is, but when we look at the sin of our land we can’t help but see that God must be grieved. Yet, His mercy is great. While we certainly have not deserved God’s blessings, He has given them nonetheless. But will the blessings last? I believe we are living on the laurels of the past and sadly the godly heritage and biblical foundation that this country was built upon is cracking. The Psalmist states, “If the foundations be destroyed, what can the righteous do?” (Psa 11:3) The examples of destroyed foundations are many, with homosexual marriage and abortion being at the top. Another one that has chipped away at not only our freedom but the very foundation of this country is the latest ruling of the Supreme Court on the unconstitutional health care law. Justice Roberts surprised the nation with his vote. But what I found interesting was part of his explanation in which he said, “It is not our job to protect the people from the consequences of their political choices.” Consequences – that’s not a word we talk about a lot, but if we would read the Bible we would realize that it is filled with consequences. There is no doubt that we are living with the consequences of the previous election. The people wanted change and that is exactly what we got. And now we have gotten ourselves into a mess. “Let every soul be subject unto the higher powers. 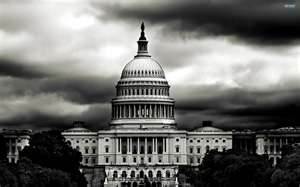 For there is no power but of God: the powers that be are ordained of God.” (Rom 13:1) God has ordained government and He alone determines who rules. Sometimes, like the children of Israel, God gives us not what is best but what we ask for. Maybe, just maybe, we will learn. The cycle of sin always goes like this – abundant blessings, sin/rebellion, God’s judgment, and repentance/forgiveness. Then the cycle starts over again. Time and time again we have seen it with the children of Israel. Time and time again we see it in our own lives. The people of God need to humble themselves, pray, seek God’s face, and turn from their wicked ways. Will we be able to bear the consequences if we don’t? “How is your church doing?” It is a common question asked among Christians. I have found that what people usually want to know when asking this is, “How are the churches ABC’s (attendance, buildings, and cash flow)?” Unfortunately, too often man will use these measures to gauge success. But is attendance, or numbers, the most important criterion for success? What about the building? Does a beautiful multi-purpose church building have anything to do with success? What about cash flow? Is wealth really a factor? And because this is such a common attitude we can quickly become pragmatic when we use man’s standards to define success instead of God’s Word. Some church leaders evidently think the four priorities of the early church—the apostles’ teaching, fellowship, the breaking of bread, and prayer (Acts 2:42) make a lame agenda for the church in this day and age. Churches are allowing drama, recreation, entertainment, self-help programs, and similar enterprises to eclipse the importance of traditional Sunday worship and fellowship. In fact, everything seems to be in fashion in the church today except biblical preaching. 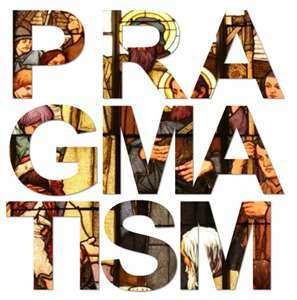 The new pragmatism sees preaching—particularly expository preaching—as pass‚. Plainly declaring the truth of God’s Word is regarded as offensive and utterly ineffective. We’re now told we can get better results by first amusing people or giving them pop-psychology and thus wooing them into the fold. Once they feel comfortable, they’ll be ready to receive biblical truth in small, diluted doses. So, let’s be committed to God’s Word. Let’s measure success by His definition. And let’s cast off pragmatic ideas about church growth and look to the truth found in Scripture. And truth is certainly not tested by what works and what doesn’t work.